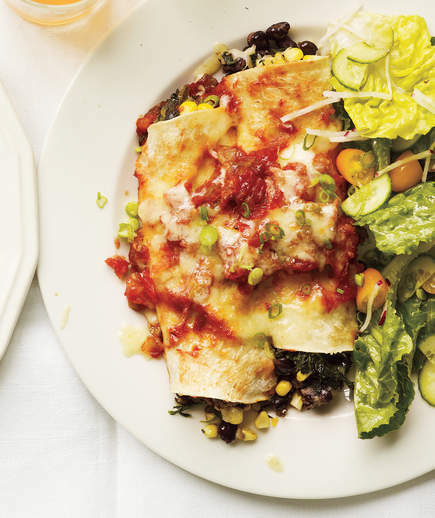 Slow-Cooker Bean and Spinach Enchiladas boast a hearty, vegetarian filling, and while they might look labor intensive, they actually couldn’t be easier. You’ll mix the filling (no cooking required) before rolling your enchiladas and placing them over a layer of salsa in the slow cooker. Top with a bit more salsa and cheese, turn the slow cooker on low, and you’re good to go. The side salad provides a great crunch, fresh counterpoint, with romaine, radishes, grape tomatoes, cucumber, and a zesty lime dressing. In a medium bowl, mash half the beans. Add the spinach, corn, cumin, 1 cup of the Cheddar, the remaining beans, 1/2 teaspoon salt, and 1/4 teaspoon pepper and mix to combine. Spread 1 jar of the salsa in the bottom of a 4- to 6-quart slow cooker. Dividing evenly, roll up the bean mixture in the tortillas (about 1/2 cup each) and place the rolls seam-side down in a single layer in the slow cooker. Top with the remaining salsa and Cheddar. Cover and cook until heated through, on low for 2 1/2 to 3 hours. Before serving, toss the lettuce, radishes, tomatoes, and cucumber in a large bowl with the lime juice, oil, and 1/2 teaspoon each salt and pepper. Serve with the enchiladas and sprinkle with the scallions.